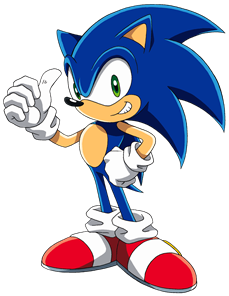 In order to protect the current customer pool, Sonic is no longer for sale. I may reopen it back up in the future but there are no plans right now. Introducing SONIC... the one and only Hyper Turbo Heads Up SNG profile available. This profile has been in development for the past two years by a HUSNG expert and debugged and improved by myself over the past few months. It has been coded based on expert coaches, training videos, and analyzing hands with Poker Tracker 4 and ICMIZER 2 to optimize it's game play. We took our hand database and created custom code for each effective stack size, analyzed opponent tendencies. 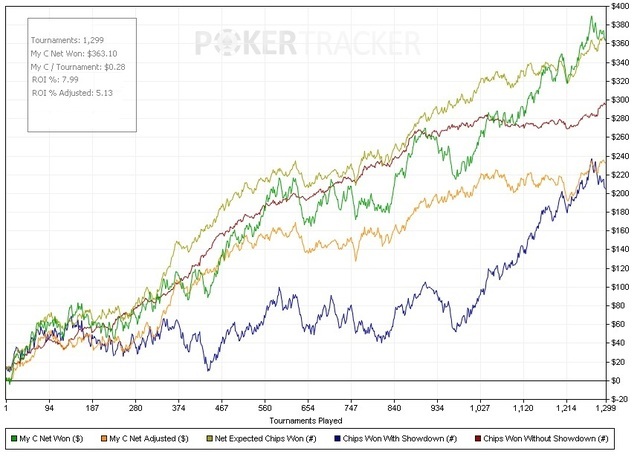 After doing this it was obvious that most people in low stakes HU Hypers are much too passive under 15bb effective stack sizes, which is the most important stack range in these games. What are Hyper Turbo Heads Up SNGs (HUHT)? Starting stacksize of 500 chips, starting blind size of 20+/-, and 2-3 minute blinds. This structure is what allows you to play over 100 games/day. SONIC starts playing mixed (LIMP and MR) and carefully at 15+ BB. Under 15BB eff it starts to be aggressive but still much by MR (and Call 3b shove wider) and some random traps (Limp -> shove) to fight against opponents who raise limpers often, which is pretty common at mid/low stack depth. Under 10BB it will change it up by wide Openshoving, but still limps most of the hands which has much better EV than open folding up to 5BB eff. It also fights vs limpers well by 3Xing or ROLing them depending on effective stack. As far as postflop, it goes for cheap aggression by doing lots of small cbets/donks/leads/stabs. This is critical in order to steal small pots. There is no need for high cbet sizing in these games because from our database and experiences people fold almost same to 30% pot size cbet as 50% pot size cbet. This profile has been tested in games as low as $0.50 and as high as $15. 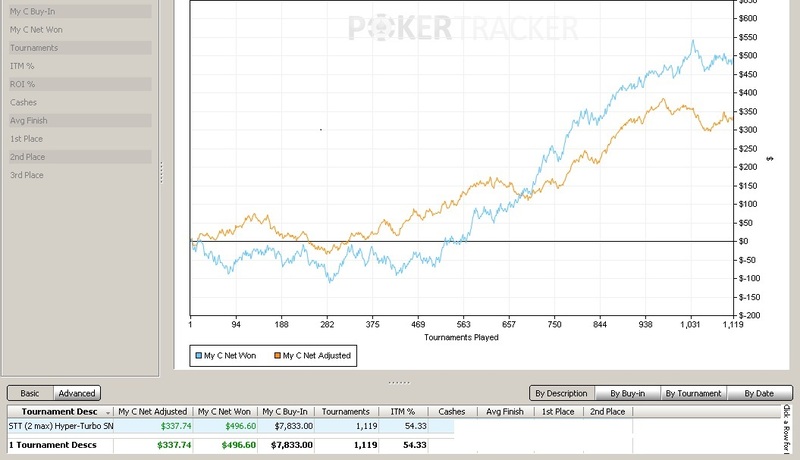 Results shown above average out to $7 buy ins, played mostly on iPoker. Why is this profile $99??? The answer is simple... take a look above at the profit projections based on our data. We averaged an ROI of 4% in the graph shown at the top. 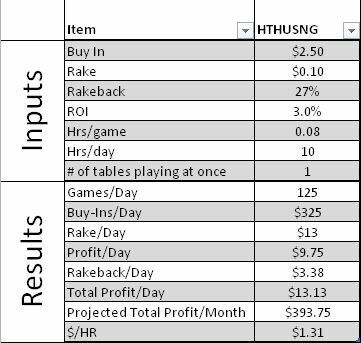 Even if you lowered that ROI to 3% as shown in the projection, that leads to a projected monthly profit of $225/month playing $1 games, and $393/month playing $2.5 games! The profile is priced so that you should be able to return your investment in a month. These games are great to grind out a profit and get some good rakeback. If you know anything about HUHT games, you know that these games have REALLY REALLY big swings! Please make sure that you have the proper bankroll for them. These games are not for the faint of heart. The variance in these games can be very high. Sweet! I'm going to pick this up when my tax return comes in! Wow! Maybe stupid question,but those 1000+ games has been played with hopper? Fazics1 is this your profile? Hi Cosmo. Is this code going to be incorporated into KGB 3.0? Yes, we have been working on this code together for a while now. He started sales for it about a week or so ago, mentioned some things in his sales thread that he should not have, thus it was taken down. That is why I started a new sales thread for it. If you were one of the few people that got it under his original thread email me and we will continue to support you with updates in the future. Some of it will be, not this hyper version though. Cosmo, im having user accounts on 3 different Ipoker skins, none of them offers HTHU games. Intresting where are you playing? I don't want to be too specific as to where we played in case of prying eyes of poker rooms but I can say that it was on two different iPoker sites. You just have to search for them. Most of I poker skin have superturbo HUSNG. 500 starting chips 2 min blinds, its the same ? suitable for NORMAL heads up SNG´s too? or only hyper turbo? The shoving/calling ranges are based on opponents ranges in hyper turbos which are pretty different than their ranges in a normal speed HUSNG. They will be shoving/calling much wider in the hyper turbo structure vs normal structure. I encourage you to make use of the dropbox folder I setup for you to share you HHs and bot logs. This will help me troubleshoot any issues you may be having and help improve the profile. Thanks and good luck! Will this profile work good on 3 man hyper jackpots?